Today I took on Stewart Mountain (3602') in the Sentinel Range Wilderness with my dog Rev. It's another peak on the ADK Hundred Highest list. It's not a long hike, but it's rugged and it's not a mountain that you set a good pace on. I was on the trail around 9:30. 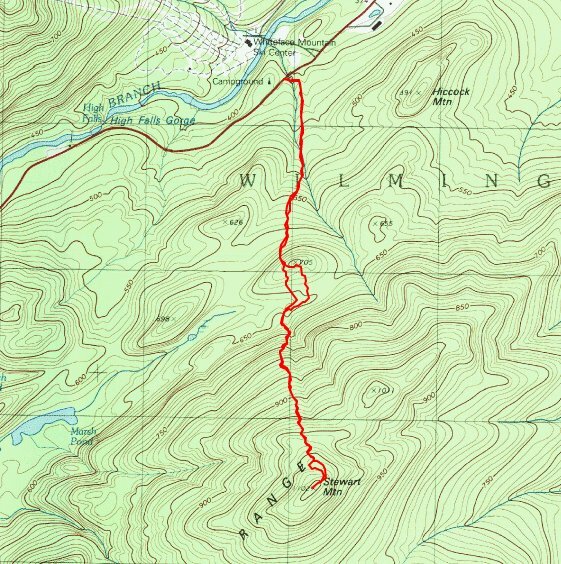 I parked at the small pulloff immediately west of the entrance to Whiteface Mountain Ski area on Route 86. Almost immediately I saw my only small waterfall of the day. I crossed the brook here and climbed on the left side of the brook to the height of land where I came to an old woods road. This is almost within sight of the car. I followed the old woods road a short distance until it ended. I continued to head almost directly south, picking my way along the easiest route I could find. After about 45 minutes and one mile, I was at th base of Stewart. This next section was the steepest, thickest part of the hike. For about 0.5 miles it was slow going. I was hoping it would not be that way all the way to the summit. Luck was with me. The grade eased and so did the tree density. It still wasn't easy but it was better. About 0.4 miles from the top I came across an interesting rock formation that had rock walled cavity that could be walked through. I began to get views of Whiteface Mountain (which was the only view I could find). Whiteface Mountain and Ski Area. I made my way slow and methodically as I continued to climb. There were lots of rotted trees covered in moss and I found several spots where I fell in up to my thigh. After 3 hours of slow climbing I found the true summit. There was a tree with a small section of bark scraped off and a letter S caved in it for Stewart. Not a big reward for the climb but it was a nice day to be out in the woods. Temps were in the upper 40's when I started and about 70 when I got back to the car. Rev and I had lunch on the summit and then Rev led the way down following our route by scent. Very nice! The only views continued to be of Whiteface but that was OK. Going down proved to be a little easier and we cut 30 minutes of of our ascent time. We got back to the car at 3 PM which was nice since we had a long ride home from Wilmington. Climbed Stewart yesterday (5/27), our approach via the mountain north of Stewart, then across/below the land bridge between the two mts. With few exceptions, fairly open woods, esp. on mt. north of Stewart. Anyway, the true summit is not the one with "S" marked on the tree it is further south. GPS registered 3612 ft. Indeed, we found several small knobs whose elevation was higher than 3603 ft.; they were in vicinity of 3608 ft.
We descended via your route up-it was awful. Took us 5 hours to descend; 3.5 to climb. The north peak had a large rock knob with great views of whiteface. Sorry the route I mentioned did not work out for you. You never know what you will find bushwhacking. I'm glad your ascent wasn't bad.